Paid subscription is a method to give forum benefits to your users in exchange for a monetary donation or payment. With this function, you can choose the name of the donation, amount, and a membergroup that will be automatically assigned to the subscribed user, as well as other options. Once you have set up subscriptions, your forum members will be able to buy the subscriptions from Profile -> Actions -> Paid Subscriptions. The subscriptions must be enabled first. This can be done by going to to Administration Center -> Configuration -> Core Features and selecting the Paid Subscriptions option. PayPal is currently the only payment service supported by SMF 2.0.x. It is not necessary to enable Instant Payment Notification (IPN) in your PayPal account for paid subscriptions to work. Your forum sends a notify_url, which contains the return url, when it posts a payment to PayPal. 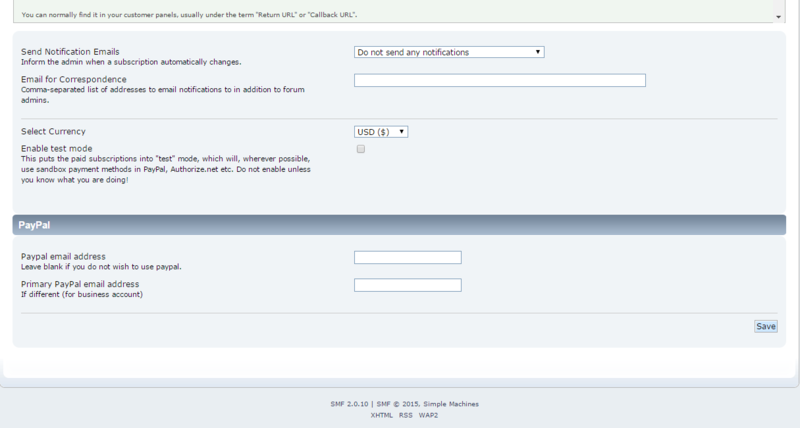 This overrides the account IPN settings, and PayPal will send an IPN to your forum regardless of the account settings. If you enable IPN, you will receive an IPN when any payment is made to the account for any reason. If the forum receives an IPN for a payment unrelated to paid subsciptions, it will generate an error, and send an error email to admins if notification is enabled. Select Currency - Selects the currency USD, EUR, GBP, etc.